In this article we will see how to use DatePicker in MVC3 Razor. We do not have html helper to render DatePicker in MVC3. We are going to use jQuery DatePicker to fulfill our requirement. We have created a ViewModel. We have defined a property named DOB of type DateTime. We are going to bind our view with this ViewModel. Our View looks as above. We have include the reference of our ViewModel. We have used EditorFor helper to render control for address property. We have also added the script section. In the script section we have used id of control to select the control and used datepicker() method to render datepicker. We have include following jQuery reference in the layout file to datepicker to work. Include above references in your layout and refer this layout in your view. Following above steps we can use jQuery DatePicker for our MVC3 application. jquery DatePicker on button or image click. Date Format supported in jQuery DatePicker. Restricting Date range in jQuery DatePicker. 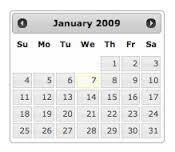 Populate alternate field using jQuery DatePicker. Inline mode in jQuery DatePicker. jQuery DatePicker with month and year Menus. Display button bar in jQuery DatePicker. Diaplay dates of other month in jQuery DatePicker. Display week of year in jQuery DatePicker. Display multiple months in jQuery DatePicker.